Ten years on, and on the heels of a reunion, the Get Up Kids look back. 1999 was a big year for the Get Up Kids. As they looked back, the previous four years had been a roller coaster ride. The Kansas City band had enjoyed widespread adulation from the release of their first 7”, following it up with two hugely successful releases on local indie Doghouse. As they reached the end of their Doghouse obligation, it seemed that the Get Up Kids needed a larger engine than Doghouse could provide. Wining and dining ensued. The band was just about to sign to Mojo Records when Rich Egan and Jon Cohen from indie upstarts Vagrant landed the band in 1999 with a sizable advance and the offer of their own Heroes and Villains label imprint. The role of Vagrant Records in the success of the Get Up Kids is not one to be understated. The two rose symbiotically, sharing a collective rise in profile that served as a huge springboard for both parties. 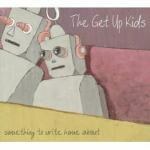 Something to Write Home About was the first Get Up Kids release on Vagrant. It was also the record that the label literally bet (and built) the bank on. Vagrant extended themselves well into the financial danger zone personally and professionally, with co-proprietor Jon Cohen mortgaging his family’s home to finance the record. Luckily for all parties, it proved to be an extremely wise investment. Something to Write Home About sold like the proverbial hotcakes, providing the initial financial and credibility foundation for Vagrant to become the über-indie force that they are today. In the annals of the Get Up Kids history, Something to Write Home About is a milestone for a number of reasons. First and foremost, it can be argued that it was the last good record the band made. Second, it marked the formal addition of keyboardist James Dewees to the band ranks. The former Coalesce drummer brought equal parts keyboard texture and unnecessary Carrot Top-esque live buffoonery to the table, a move that was ironically a simultaneous marker of the band’s first step towards a more mature pop-rock direction and one that continues to polarize fans to this day. The band had always claimed that they were cut from more indie cloth than the emo tag that they were issued in their salad days and hereafter the Get Up Kids, especially main singer/guitarist Matt Pryor, strove to be taken seriously. Arguably successful in their quest, it proved to be somewhat of a pyrrhic victory, most conspicuously at the expense of the youthful energy they were still able to muster here. Something to Write Home About kept the edge of their Doghouse past, but sported cleaner production and more hooks than a tackle box. The 12 songs are the strongest body of works they had been able to muster prior or since. It was obvious that the Get Up Kids were poised for very big things. The record opens with “Holiday”, a song that literally and figuratively bid adieu to their DIY roots. Most of the tracks wrestled with such introspection. and tellingly, the record reprised two songs from seminal pre-Vagrant singles: “Ten Minutes” from their Sub Pop single series release and “I’m a Loner Dottie, a Rebel” from the Tree Records Post-Marked Stamps series. The latter a split with Braid that is perhaps the finest song in the Kids canon. “Ten Minutes” marked the high water mark for co-singer Jim Suptic, a Kid who found himself increasingly marginalized by the music Pryor and Dewees brought to the table. Something to Write Home Aboutt established the Get Up Kids worldwide as a top live draw and strong sales presence, but it proved to be at the expense of the band’s personal relationship. Internal politics saw the band becoming increasingly more fragmented and while subsequent records featured production from heavyweights like Gil Norton and Scott Litt, the band never captured lightning in a bottle like they did here. The 10th Anniversary reissue adds a DVD of a 2009 reunion show from their hometown of Lawrence, Kansas where they play Something to Write Home Aboutt in its entirety, along with a couple of other chestnuts to keep it interesting. The anniversary show is far from the band’s most spirited performance. To see it, it sure seems like somebody in the band thinks that he is the band. I’ll let you draw your own conclusions as to who the party is, but if you only get an inkling of that from this show, watching the bonus DVD footage of the band from their early days will only drive the point home. The footage captures the Get Up Kids in a more innocent time, a time when they were a band at home with their sound, rather than writing home to that figurative sound ten years after. Ten years on, Something to Write Home About is a seminal record from both the Vagrant and Get Up Kids canons. Both parties should be exceedingly proud and with this top-shelf commemorative re-issue and the extras therein, it’s well worth basking in the nostalgia.